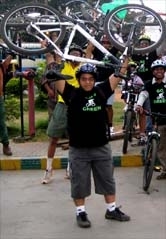 GoGreen Campaign Ride towards Malleshwaram Railway Station 20 Jun 2010 - GGI-Group size: 4000+ Professionals, Increasing on day to day basis, Come & join us 2 serve Mother Nature. Started from RIS Junction by sharp 6:45am. 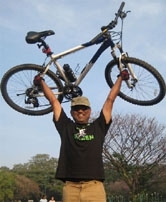 reached Cubbon park by 7:15am. We met other group member from other parts & decided to ride towards Sanky Tank lake their after towards Malleswaram's famous canteen "Raghavendra tiffin Center" located just opposite to the Railway station. Manasi hosted a treat for buying a brand new Trek 3700. We reached back to RIS junction by 9:55am. Vidhan Soudha - Raj bhawan- Chalukya Hotel - Golf Court - Windsor manor under flyover - Cavery Theater - Sanky Tank - Malleshwaram Railway station. Sampagi Theater , Natraj Theater Circle, under flyover, BTS bus stand, Balpet lanes, Mysore Road, National Colleage, Chamrajpet Police station, Southend circle, Jaynagar 3rd Block, Jaynagar 4th Block, KFC, RIS junction. Group Photo Snap @ Cubbon Park City Library. 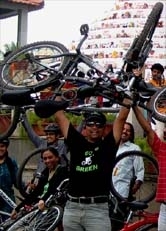 Bike Salute @ Malleswaram Railway station..